At CES 2019, Western Digital demonstrated a number of direct-attached flash solutions. Out of all the showcased items with imminent retail availability, one deserves separate mention. Under the SanDisk brand, Western Digital is introducing an higher-performance follow-up to the the SanDisk Extreme Portable SSD (a portable USB DAS that has impressed us with its performance and thermal characteristics). The new product carries the PRO branding and will be available in retail in Spring 2019. Almost all high-end flash-based bus-powered storage devices now use a Thunderbolt 3 Type-C interface with a PCIe 3.0 x4 NVMe SSD behind the Alpine Ridge controller. Some vendors have made an attempt to bring economical alternatives in this market segment by using a PCIe 3.0 x2 NVMe SSD (reference design from Phison). However, leading brands such as Western Digital / SanDisk and Seagate have refrained from playing in this market with mainstream offerings. The reason is not hard to see, as these high-performance Thunderbolt 3 SSDs can't be used with regular USB Type-C ports despite being physically compatible. This results in the vendors having to field customer support calls from the average users. Thanks to the introduction of USB to NVMe bridges such as the JMicron JMS583 and the ASMedia ASM2362, it is now possible to create M.2 NVMe SSD enclosures with a USB interface. Intel's Titan Ridge Thunderbolt 3 controller (the follow-up to Alpine Ridge) also includes a USB fall-back when used in client devices (Alpine Ridge has USB fall-back only when used in a host configuration). We reviewed MyDigitalSSD's M2X Storage Enclosure (using the JMS583 bridge chip), and found that it delivered great performance. Such storage enclosures do come with some caveats – particularly with respect to the firmware / power state configurations of the NVMe SSD being used. Western Digital is introducing a similar configuration with the SanDisk Extreme PRO Portable SSD. The form factor and industrial design seem to be following the venerable SanDisk Extreme Portable SSD, retaining the IP55 rating. That SSD uses a M.2 SATA SSD in a plastic enclosure with a silicon rubber coating. The Extreme PRO Portable SSD uses a NVMe drive, and the enclosure is made of aluminum (for better thermal performance) with the same silicon rubber coating. This is necessary because the NVMe SSD may likely end up generating more heat because of the increased speeds. Western Digital is claiming reads at up to 1 GBps with the Extreme PRO Portable SSD. From a market perspective, it is great that WD is making NVMe-USB bridges mainstream. The firmware of the internal SSD is fully under their control, and the company does extensive validation prior to releasing products into the market. Therefore, we have no doubts that the 'ready-to-use out-of-the-box' SanDisk Extreme PRO Portable SSD will have very wide compatibility across a variety of USB ports (ranging from delivering full performance over USB 3.1 Gen 2 ports to operating within the power constraints enforced by USB ports in legacy systems). The SanDisk Extreme PRO Portable SSD will be available in 500GB, 1TB, and 2TB capacities, starting in Spring 2019. Pricing is yet to be decided, though it will need to be competitive against similar-performing DIY configurations that can be built for around $0 / $135 / $260 at the 250GB / 500GB / 1TB capacity points. 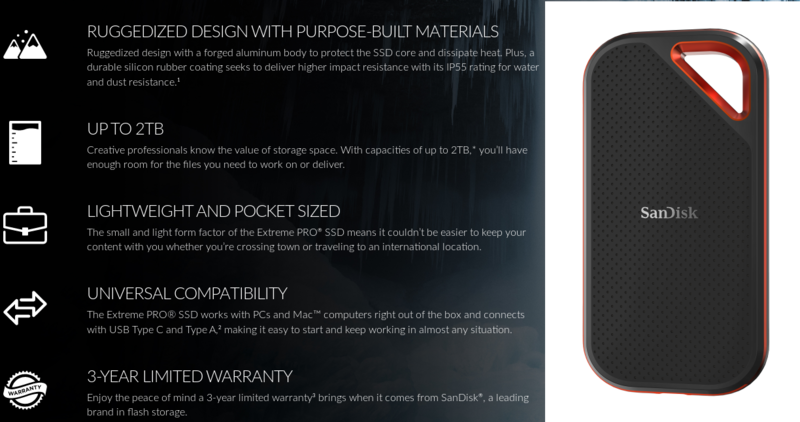 [ Update from Western Digital: The SanDisk Extreme PRO Portable SSD will be available worldwide in Q2. The drive will be available in capacities of: 500GB – $199, 1TB – $349, 2TB – $599]. Like the SanDisk Extreme Portable SSD, the PRO version comes with a USB 3.1 Gen 2 Type-C interface, and includes a Type-A adapter. It will have a 3-year warranty.